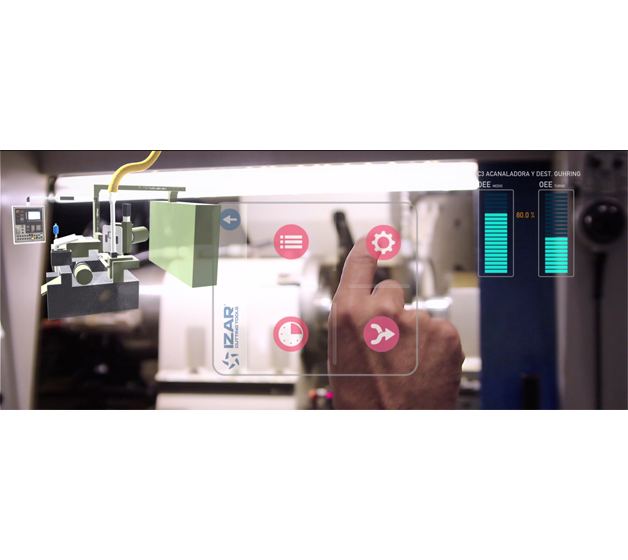 IZAR, the cutting tool manufacturers, launch their most innovative CYBER-INDUSTRY project together with their technology co-operators, Somicro and Virtualware, using virtual reality and augmented reality tools in the manufacturing process. The project consists of designing a pioneer system based on “capturing data on shop floor” and managing these data in real time, such as yield of each machine, monitoring manufacturing orders in real time, prioritizing these orders depending on the urgency of the customers’ orders, etc. Augmented reality means that the operator can view the computer-generated data that he has in front of him, and thanks to the virtual reality, he can interact with these data without interferences from the outside, detecting possible problems that might arise in real time, such as hidden wear and tear, or faults in the machines, quality defects or time losses. The final objective of this project consists of managing the manufacture of IZAR’s more than 65,000 articles, which generate more than 50 orders each day, with different manufacturing rates and deadlines, in a much more optimal and efficient manner. It will be possible to view each order in real time, precisely calculating when the tools will be finished. This system will permit establishing much more accurate lead-times for the orders, improving customer support and service, the company’s strategic pillars. This demo video (see video)show what this futuristic project consists of, how the new technologies become IZAR’s best ally, and IZAR itself into an avant-garde company, at the spearhead of the fourth industrial revolution, or Industry 4.0.